Before Rev. Dr. William J. Barber II took the Moeser Auditorium stage to deliver the 2017 Weil Lecture on American Citizenship on October 11, Yara Allen, historian, signer, and musician, led the audience in a moving call and response inspired by a town hall meeting for people harmed by coal ash contamination. She sang, “Somebody’s hurting my sister, and it’s gone on…” “Far too long,” we responded. 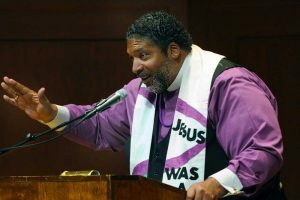 A collective meditation on environmental and health justice was a fitting introduction, not just to the oration of a southern preacher, but also to his message: our American democracy is sick. It would be disingenuous of me not to admit my initial hesitation when hearing Barber diagnose the “moral malady” plaguing American democracy. As a student, scholar, and teacher of health humanities, I am all too familiar with the ways in which illness has been politicized. Relying on an illness metaphor to analyze the body politic, I feared, might lead us down a path that Susan Sontag warned us against in 1978 (and again in 1988). “It is hardly possible,” she writes, “to take up one’s residence in the kingdom of the ill unprejudiced by the lurid metaphors with which it has been landscaped.” Illness metaphors, she teaches us, influence the way that people experience illness, often in harmful ways. The “battle” against cancer, for instance, threatens to blame a person with cancer, especially if they “lose” their battle. And yet, Barber’s diagnosis of the diseases that threaten American democracy deftly navigated history, narrative, and language to call for a shift in the “moral narrative” of the country without blaming the patient. Barber began his lecture with a reminder that what we are seeing in America—white supremacy, divisive politics, and challenges to dissent—is not new. While UNC was hosting the first Weil Lecture delivered by former President William Howard Taft in 1915, President Woodrow Wilson was relying on white nationalism and fear mongering to carry out his “deconstruction of Reconstruction.” In between the Wilson and Trump Presidencies lies a long history of injustice that Barber drew upon to diagnose our present moment. According to Barber, five diseases threaten American democracy: systemic racism, unjust attacks on the poor, ecological devastation, the war economy, and Christian nationalism. Barber explained that the call for racial justice has been met with a response of regressionism and what Carol Anderson has called “white rage” that reinscribe systemic racism. But injustice in America is not limited to racism; immoral attacks on the poor place blame on the impoverished, recalling the question that W. E. B. Du Bois is at a loss to answer in The Souls of Black Folk: “How does it feel to be a problem?” A strange experience indeed. Ecological devastation suggests that not all disasters are “natural.” Barber pointedly reminded us that in Flint, Michigan “you can buy unleaded gas, but not unleaded water.” Meanwhile, the war economy undermines our moral standing in the world and diverts resources away from programs that can actually help. We have the resources to do good, Barber suggested, “what is scarce is our moral capacity.” Finally, Christian nationalism, in its attempts to establish Christian rule at the expense of racial and sexual minorities, amounts to theological malpractice. In his 1963 “Letter from a Birmingham Jail,” Martin Luther King writes, “Nonviolent direct action seeks to create such a crisis and foster such a tension that a community which has constantly refused to negotiate is forced to confront the issue. It seeks so to dramatize the issue that it can no longer be ignored.” Barber’s diagnosis serves a similar purpose. To say that our democracy is sick forces us to confront the issue without spiraling into fatalism—the diagnosis is not terminal. Like his own sick body, our national body can be healed. Rather than offer a snake oil or a magic bullet, Barber prescribed action through moral analysis, moral dissent, and moral activism. It is time for us to “disrupt that which is disruptive,” he said, and usher in a third Reconstruction. There is a powerful sense of hope in Barber’s call for healing even as it relies on illness metaphors. During his lecture, I was reminded that metaphors can do important work. Providing cognitive shortcuts, they help us wrap our heads around complex problems. A metaphor can take what feels like an overwhelming, incomprehensible social and political climate, diagnose it, contain it, and offer a tonic to salve it. And we won’t be silent anymore. Kym Weed is a Ph.D. Candidate and Senior Teaching Fellow in English and HHIVE Assistant Director. 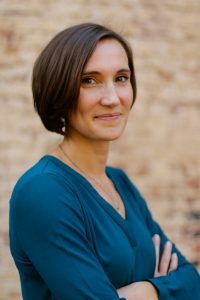 Her dissertation, “Our Microbes: Imagining Human Interdependence with Bacteria in American Literature, Science, and Culture, 1880-1920” merges her backgrounds in microbiology and English to examine “friendly microbes” in American literature and bacteriology from germ theory to antibiotics. She teaches courses in American Literature, Health Humanities, and Rhetoric & Composition. Lisa Diedrich’s blog roll thoughtfully catalogues the illness politics of the 2016 election and beyond. See especially, “Illness as Metaphor, 2016,” posted on 2 Oct 2016. Susan Sontag, Illness as Metaphor (1978), pp. 3-4. Ibid., 57. Arthur Caplan recently rejected the battle metaphor when writing about Sen. John McCain’s cancer diagnosis for Forbes. Carol Anderson, White Rage: The Unspoken Truth of Our Racial Divide (2016). W. E. B. Du Bois, The Souls of Black Folk (1903), pp. 1. Martin Luther King, Jr., “Letter from a Birmingham Jail” (1963), par. 9.